The whole world of social media is relatively new to me. When I decided to rebrand and start my blog I had to learn a thing or two about the various platforms out there which I could tap into. I am slowly gaining confidence and followings in various areas such as my Instagram account, Facebook, Pinterest and Twitter accounts and still get really excited when I get notifications of new followers. Its what drives me to write more, because more and more people are taking an interest in the subjects I am writing about and I now I've started I'm determined to deliver! What I find most exciting about social media is not the followings though its the connections that are made. I have discovered so many new and exciting companies and businesses through my networks, one thing leads to another and leads to another and so it is that I discovered Diane Hill and her incredible talent. It was only a few months ago that I was taking my parents in to the Fromental showroom in Chelsea Harbour to show them the stunning hand painted wallpapers that were on display. Little did I know at the time that some of the work could have been that of the then head designer, Diane Hill. She has since left the company to set up on her own and has literally launched her website this week. So this is really fresh and exciting news for anyone out there looking to tap into some true talent in their interiors. I have interviewed Diane to learn a little more about the work she does and the skill involved. As you read you will discover the positive power that social media can have within her response, spurring her onto create this company. Please support this new start up - I know she's going to be a sensation! Diane Hill - Hand Painted Interiors has recently been created, we would love to learn a little more about who is Diane Hill and the formation of the company? I have been creative right from toddler years, my mother tells me of how I used to draw all over the walls! (I certainly would not be allowing that in my home ha!) I have always known for certain exactly what i wanted to do and achieve in life and it has always been very much art and design driven. I studied textile design at manchester metropolitan university, this was a fabulous course with a strong focus on hand painting. Following on from university I got my first and only design job with Fromental, one of the biggest handmade wallpaper companies in London. I worked there for 6 years then finally decided it was the right time to set up on my own. I had lots of ideas itching to be transferred onto walls! I really just wanted that free reign to design whatever I wanted, in whatever colours I chose! The company has so far been formed through a lot of hard work, DIY and many favours! It all started with my youngest daughter Bonnies nursery room which I painted very slowly (in and out of school runs and nap times) over some months. I really wanted a chinoiserie paradise for her! I decided to share some iphone snaps on my personal Facebook page and the reaction was bigger than i could ever had imagined. It was shared online over 250 times. I think it was at that point that I really believed this could be a great business. So I got to work right away on building my website and getting professional photography. Where did you learn the skill of hand painting wallpaper? I visited a Chinese painting studio with around 100 artists. There I learnt many interesting techniques and how to use natural Chinese brushes and water colours on silk. I have lots of painting DVDs and books that I constantly refer to. It was also a lot of learning on the job, i have many years of practise in repairing silk wallpapers on site in many locations. I remember after about a year or two the technique just clicked and I felt very comfortable and at ease painting. What techniques do you use to create your designs? I use acrylic paints when painting murals as this is the most durable paint. I have a mixture of chinese and european brushes. I either create very detailed paintings through layering and shading. Or I paint in an 'unconscious' style. This is an ancient Chinese painting style where the brush leads the way, you must already know in your mind what you are painting, then just freely paint using minimal brush strokes. 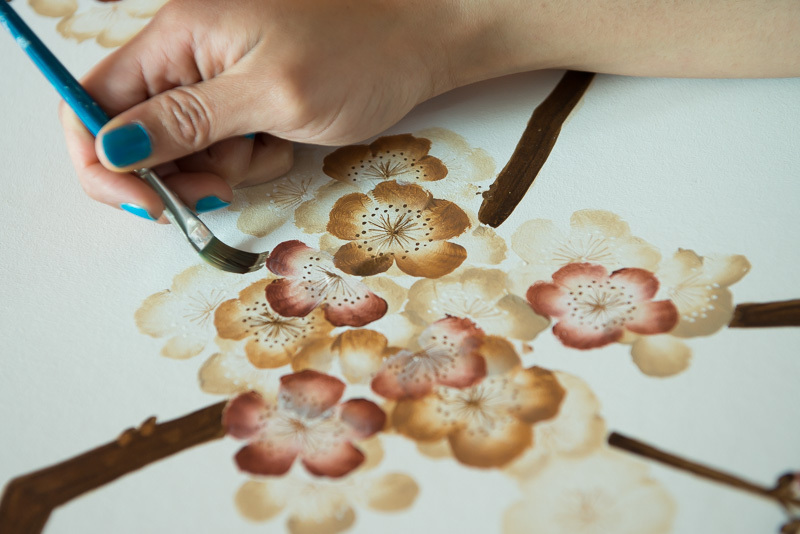 With this technique, each petal or leaf is created using one brush stroke only. 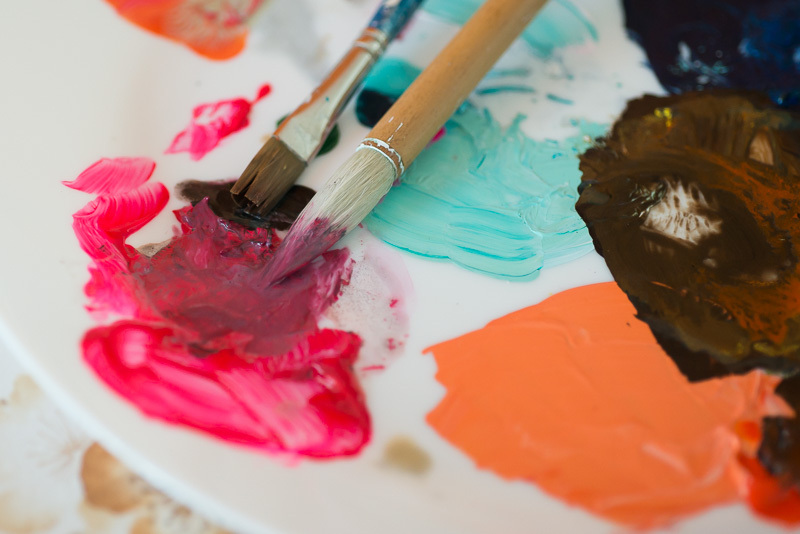 There is a special way of building up a shade of colours on one brush from light to darkest (at the tip), this way you can paint all the shades you need in one brush stroke. I always like seeing something beautifully coloured. My favorite artists are Matisse and Dufy. I am very inspired by Chinese and Japanese art. I am particularly drawn to the use of composition from oriental art, and especially Chinese export art of the 18th century, known as chinoiserie. I love looking at the antique chinoiserie wallpapers for inspiration, they are just so beautiful. Pinterest is an invaluable source of images for me, i am constantly pinning new ideas and colour schemes. 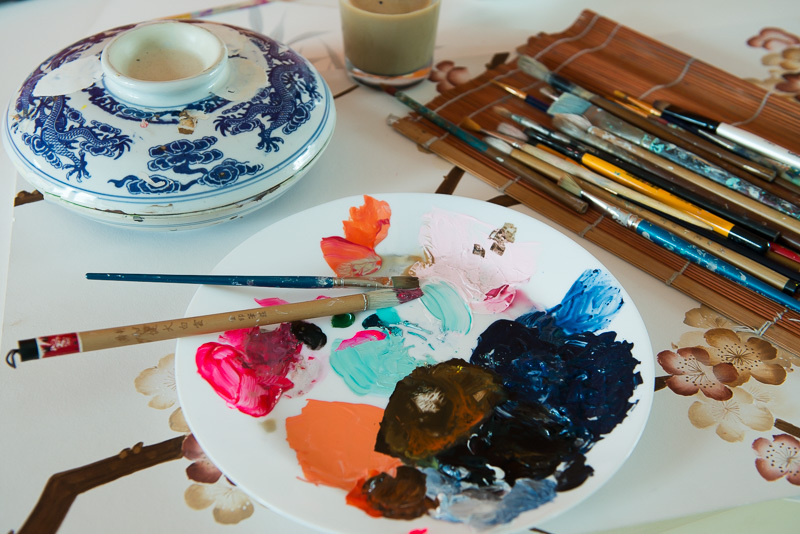 What surfaces do you paint on and do you always paint in situ? I paint onto bare walls mainly, but can also paint onto canvas or wallpaper. Recently I have painted directly onto the wall (as seen on images on website), at Fromental I always painted onto silk or paper which was then hung as wallpaper. I love painting on site as I really love being in new places and spaces and especially meeting new people. I find that my clients like to sit and watch me paint, and i really love that people find it that interesting! What does the process involve, from first meeting to finished art piece and how long does this usually take? The process does take a little dedication - it really is a luxury thing and should be treated with the utmost care and attention to detail right from the beginning. However this is mainly on my part. The role of the client is more in saying yes or no to my options. Initially it is my job to gauge a clients interests, what makes them excited - then I am able to create something that I'm sure they will love. There may be instances where a client knows exactly what they want and i will just create something to a specific brief, and in other cases a client will need guidance throughout the entire project - in these cases I can present ideas to the client and come up with something I think they will love. First point of call is usually gauging the ideal space and surface, i usually ask for measurements of the space and a brief evaluation on the condition of the surface. Ideas and themes will then be discussed and i can come up with a rough estimate of cost at this point. I also tailor designs to clients budgets. I will usually also share a pin board of images to gauge a clients reaction to certain styles or colours. Once we have decided on a theme i will sketch out a design in pencil showing scale, composition and general design placement. I call this a 'miniature'. Once the client is happy with this we will then move onto a painted sample. This is a section of the design in full scale (usually painted on A3 size) showing all colours, technique and paint style. There may be some changes necessary to the design layout and colour sample. I always ensure that the client is absolutely happy with the work before any painting on site commences. We work together until everything is perfect and ready to go. It may involve a meeting on site with the sample or I will post that to the client. I will also produce a miniature colour rendering, which is a small (often digital file) drawing showing the entire mural in colour. This is necessary so that there are no surprises! Once all is approved the client will sign off and work will commence. This process usually takes as little as a week or two, though for very complex projects could take a few weeks. It all depends on the amount of changes the client has requested! For more information please contact Diane Hill directly, please see various links below.